The Red Sox have been struggling mightily lately. After losing two, 3 game series in a row with Seattle and Arizona, they have managed to win one of two from Toronto. It was good to see them win a game for a change last night. They fell behind, as usual, at one point 5-0, but they managed to come back and win the game 7-6 with two 9th inning runs. Mitch Moreland was the hero again driving in two runs in the game that saw it tied each time 5-5 and 6-6. Finally, Devers got a base hit with the bases loaded to end the game in their favor. It was a rare win and we can only hope for a lot more where that came from. Well, the Red Sox dropped the final two games in the series against Seattle in poor fashion. In both games they were given the chance to come back and win but did not take what was given to them. In the first game the Seattle third baseman made three errors in a row that resulted in three runs but they could not get the needed hit to drive in the run to tie or two runs to take the lead. In the second game the “closer” for the Mariners threw 12 balls out of 14 pitches and walked three to load the bases with one out. He was taken out and the next pitcher walked another to get the Sox within one. The next two batters could not get anybody in, when a single by either one would have given the Sox the lead, and the game ended without them taking advantage of gifts given to them by the opponent again. The Mariners tried to give them back two games back to back but both times they could not get the hit they needed. The Red Sox looked like a version of their 2018 selves again in last night’s game. They managed a come from behind victory in which after 4 they trailed 6-1. They chipped away at the lead, blowing two 1rst and 3rd no out situations and then Moreland blasted a three run homer that gave them the lead for good in the top of the 9th. 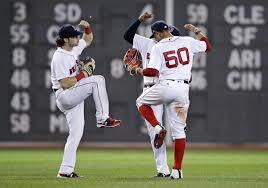 Barnes then came on and closed for the missing Kimbrell and the Sox held on to win 7-6. They managed such come from behind wins quite often last season so it was good to see them do it again. It makes us think it going to be another great season.